Pull motor: The first in-feed roller to each station is fitted with a driven torque controlled motor to keep controlled tension in the product. Operator controls: PC controls for all spooling actions and independent operation, controls fitted to each station. Spooling types available: 1 degree adjustable lobe winding / pineapple winding. Most narrow width materials requiring extremely long lengths have traditionally been spool wound to form a convenient package for handling, shipping, and unwinding. The finished spool size varies according to the needs of the next operation (de-spooling) or the material handling capacity. Regardless of the spool size, every traverse winding operation requires a “traverse” system to either move the material sideways laterally across the spool or to move the spool sideways laterally below a fixed application point for the material being spooled. 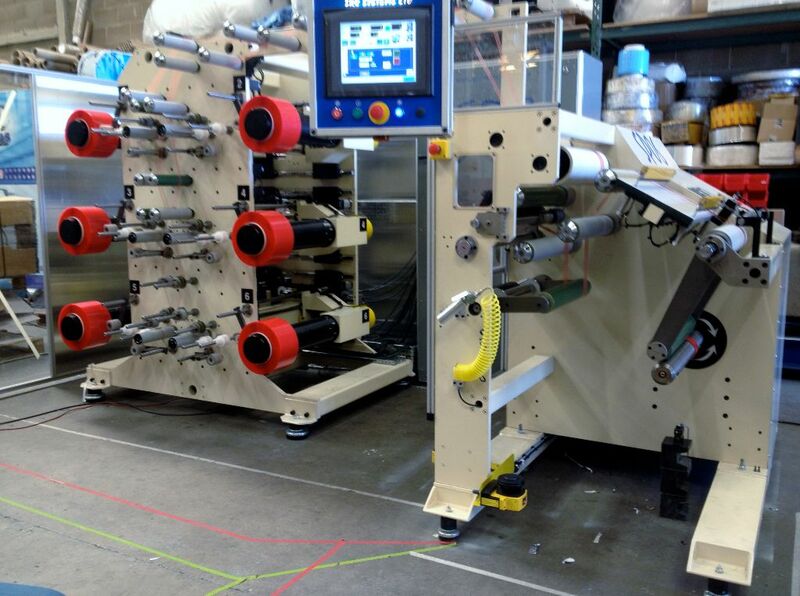 For narrow tapes, flexible materials moving the tape across the spool is the standard spooling method because with controlled product “twist / turn” there is little effect on finished product quality. However, with wider tapes, flat and profile materials which cannot tolerate the stresses caused by excessive “twist / turn” then requires moving of the spool below a fixed application point of the material. Selection of the traverse type is probably the most important step in determining the required spooling system. The accuracy of the traversing action, either moving the material or moving the spool, and consideration on the best traverse winding pattern is critical to the spooling process for converted materials. The traverse position accuracy can only really be maintained if it is linked to the rotational speed of the winding spool. For the tension to remain linear an accurate closed loop tension feedback system is required. The rotational speed will decrease as the diameter of the spool grows. Software (either from the PLC or directly from the drive unit) ensures synchronization of winding spool and pre-set traverse settings. The encoder provides the feedback required which maintains the pre-set winding pattern from core to required diameter regardless of speed changes. A traverse winding system works equally well with flanged spools or cylindrical cores and can be used with either. The cylindrical core also has the benefit of cost reduction (paper cores instead of more expensive flanged spools) and the ability to utilize a pneumatic lay-on roll to eliminate entrapped air and control roll density. Very often miles of material are traverse wound onto a single spool to feed the next operation without the need for splices and costly downtime. The integrity of the spool created by proper control of tension and selection of spool settings will ensure the success of the converted material in the unwinding application. Ancillary equipment specially designed for unwinding spools under the same stringent tension parameters that created the spools is now available as a useful tool to complement the spooling process. The general benefit of a spooled or traverse wound product is the ability to increase the length of material being presented to the final process. It is virtually impossible in many narrow width products to achieve a reasonable length material without using this principle. When spooling, large quantities of material can be processed which significantly reduces the down time of the final process. Since the material itself is held together / supported on the spool by the spooling action, the ability to control the unwind tension when de-spooling is far easier. Also the build-up ratio from outside diameter to inside diameter is much less and, therefore, more controllable. In many applications users of spooled product are concerned about the de-spooling process and the alignment of the web. This is not a problem, as long as the de-spooling equipment is engineered correctly for the particular product being processed. The alignment of the tape to the final product is easily achieved using standard de-spooling equipment which can be driven or non driven de-spooling units. These ensure the material is de-spooled at the required tension and alignment for that particular process. Spooling / traverse winding may not be the answer to every narrow width tape application, however it does dramatically increase the efficiency of the operation and improve productivity. The above picture shows a range of products which are traverse spool wound for the final process application. The picture also shows several different types of traverse profiles which can be achieved using the correct type of equipment.